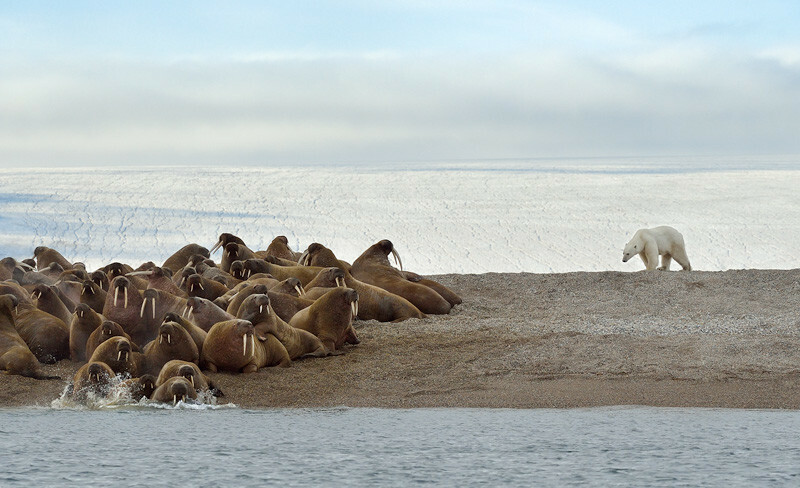 As we were approaching this group of walrus with our zodiac, so did a polar bear. An adult walrus weighs around 1,000 kg, a polar bear not even half of that. Add to that the gigantic tusks and the fact that there were about 60-80 walrus on that beach, and you would think that the bear wouldn’t even try. Slowly the bear approached the walrus, and they were getting more and more restless. And so were we! Eventually the bear got within the comfort zone of some of the walrus, and they rushed into the water - that’s what you see here. There was one short charge of the bear towards a single walrus, but not too convincing. To our surprise the bear then decided to lay down and have a nap - now that’s how you taunt your enemies.